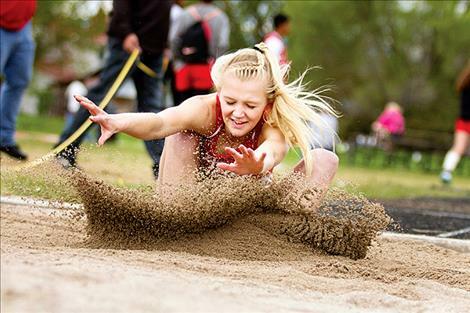 Arlee’s Carly Hergett competes in the long jump. Charlo’s Garett Vaughan jumps out to a quick start. 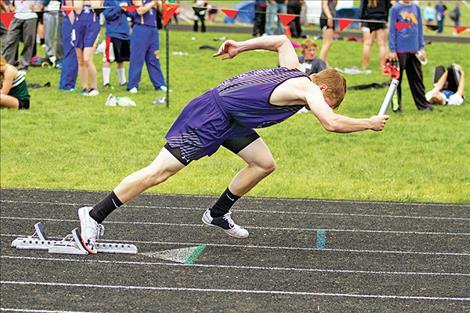 FRENCHTOWN – The Arlee girls finished second and the Charlo boys finished third in the team standings during the Western C Divisional Track and Field meet in Frenchtown on Thursday and Friday. For the Scarlets, Natalie Yocum placed first in the 1600 and second in the 800. Arlee’s Carly Hergett had the longest jump for the day in the long jump and finished second in both the triple jump and 100 hurdles. Charlo Vikings 400 relay team of Garett Vaughan, Toby Odom, Jared Doty and Landers Smith clocked a time of 45.33 good for first place. The top five placers in each event will advance to Laurel for the State C meet starting on Thursday. Team results - 1. Ennis, 72; 3. Charlo, 62; T-17. Arlee, 4. 100 - 1. Mark Estes, DRU, 11.13; 3. Landers Smith, CHA, 11.71. 1,600 - 1. Evan Duggan, DAR, 4:37.94; 5. Willis Degrandpre, CHA, 4:44.71. 3,200 - 1. Evan Duggan, DAR, 10:17.77; 2. Wills Degrandpre, CHA, 10:31.27. 110 hurdles - 1. Kye McCollaum, DAR, 15.90; 5. Toby Odom, CHA, 17.46; 6. Garett Vaughan, CHA, 17.68. 300 hurdles - 1. Kye McCollaum, DAR, 41.24; 2. Toby Odom, CHA, 42.60; 5. Garett Vaughan, CHA, 44.81. 400 relay - 1. Charlo, (Garett Vaughan, Toby Odom, Jared Doty, Landers Smith), 45.33. 1,600 relay - 1. Seeley-Swan, 3:34.91; 2. Charlo, 3:37.00. Discus - 1. Ty Morgan, ENN, 158-09; 6. Kane Shenyer, CHA, 117-06. Pole vault: 1. Lincoln Young, MC, 14-00.00; 2. Landers Smith, CHA, 11-06.00. Team results - 1. Seeley-Swan, 67.50; 2. Arlee, 65; 6. Charlo, 32.50. 100 - 1. Alex Bohlman, SS, 12.89; 4. Ahsley Revis, ARL, 12.95. 200 - 1. Alex Bohlman, SS, 26.66; 3. Ashley Revis, ARL, 27.16; 4. Allie Delaney, CHA, 27.41; 6. Tyrah Hammond, CHA, 27.88. 800 - 1. Alex Veltkamp, MC, 2:23.82; 2. Natalie Yocum, ARL, 2:24.64; 5. Taylor McCready, CHA, 2:31.16. 1,600 - 1. Natalie Yocum, ARL, 5:26.17; 6. Jaden Coston, CHA, 5:38.19. 3,200 - 1. Averi Parker, WY, 11:56.30; 5. Natalie Yocum, ARL, 12:47.40. 100 hurdles - 1. Kailee Oliverson, TB, 15.66; 2. Carly Hergett, ARL, 15.96; 5. Allie Delaney, CHA, 16.69. 300 hurdles - 1. Kailee Oliverson, TB, 47.17; 2. Allie Delaney, CHA, 47.44; 6. Carly Hergett, ARL, 50.08. 400 relay - 1. Manhattan Christian, 51.35; 3. Charlo, 52.24; 5. Arlee, 53.04. 1,600 relay - 1. Twin Bridges, 4:07.58; 2. Charlo, 4:16.95; 5. Arlee, 4:25.16. Shot put - 1. Janie Smart, SHE, 35-01.00; 4. Peyton Lammerdine, ARL, 32-01.00. Pole vault: 1. Cera Strumpfer, SS, 9-06.00; T-6. Taylor McCready, CHA, J8-00.00. Long jump: 1. Carly Hergett, ARL, 16-01.75. Triple jump: 1. Jourdain Klein, ENN, 35-10.00; 2. Carly Hergett, ARL, 35-01.00.